We at Fluid are passionate about surf and love to share this amazing sport/way of life with you! The area around Santa Catalina is a wave playground. Whether you're just getting started out or looking to push your current capacities our team is here to help you with your surfing needs and desires. Let us organize a surfari to a remote location, join a surf camp, take a lesson or rent a sweet longboard from us. We're here to help fill that stoke..and get you surfing! 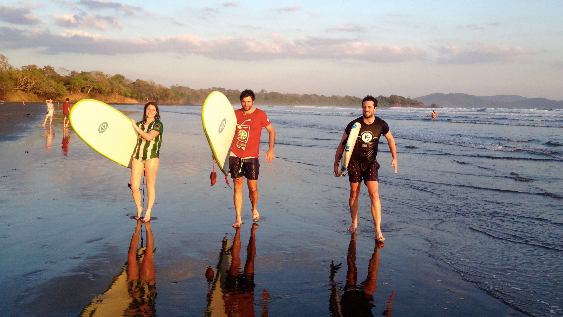 Learn about our Surf Camps here! Learn about our Surfaris here! Learn about our SUP Tours here! Price: $10/day, longboards starting at $20/day Weekly and multiple day discounts, of course. 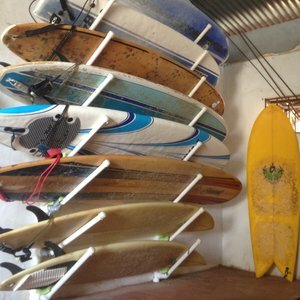 Surfboard rentals Santa Catalina: When it comes to surf, we're a little obsessed..the same goes with surf boards and equipment. Let us get you sorted with a Lost, Bic, NSP, BOA, 13's, Firewire or Stewart with longboards, funboards, softtops and a few shortboards. Looking to sell? Bring it by!! SUP Rentals Santa Catalina: If you're interested and have oceanic experience, we are happy to offer touring SUP’s. Stand up paddle boarding is a great way to explore the coastline, secluded beaches or paddle out to Santa Catalina Island for the day or a few hours. We are using high volume, quality boards designed for touring, not for wave surfing. Surf lessons Santa Catalina:1.5 - 2 hours of dedicated, focused instruction in and out of the water plus full day board rental. If you're just starting out we highly recommend a lesson. In a short period we can set you up for success. With our local knowledge, passion for the sport and desire to see you develop skills let our team get you going or advancing! SUP lessons Santa Catalina: 1.5 - 2 hours of dedicated, focused instruction in and out of the water. 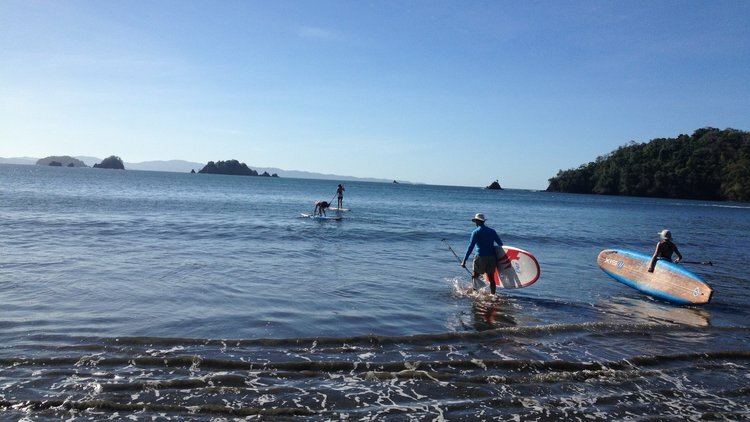 Let us introduce this fast growing sport of Stand Up Paddling. Learning the basics like how to carry the board and paddle, techniques, mounting and dismounting and environmental awareness will have you moving towards safe, self guided SUP experiences with confidence and know-how. There are a variety of conditions and a strong tidal push among the Catalina surf waves due to the fact that the tides fluctuate up to 18′ between high & low tide. When the swell is over 8 feet, you can generally surf right through the low tide; otherwise Catalina is best at medium to high tide. Low tide can get quite shallow and hollow with steep drops and very fast walls. The break offers a cent peak with rights and lefts, however the rights are more perfect and hollow than the lefts. If the wave is busy, or you prefer lefts there is a shorter left that is typically shorter and without the same competition for the longer rights. TIP: When surfing this main break, surf with respect, and acknowledge your ability. If you are not accustomed to surfing powerful, overhead reef surf, try one of the Beach Breaks (listed below). There is a definite local surf scene, as well as an established pecking order in the lineup. Lack of respect to them can lead to very frustrating sessions, as the locals can easily shut one down. Show a smile, be respectful, and the locals will return the favour! A sand beach break with hollow lefts and rights and some close-outs. About 1 mile long with rock points on each side, located South of the Catalina hotels, where the main road ends. Normally slightly smaller waves than Catalina point. This wave must be surfed at mid to low tide. Is a long beach break located to the left of the main point break, about a 15 minute walk from the town. It has lefts and rights over sand bottom. This is a favorite for beginners to start out and where Fluid instructors take you for lessons. A point break located to the left of the Estero Beach Break. It breaks at low tide over sharp rock bottom, and has lefts and rights, but the lefts are best. It is very powerful and has a great tube section. We recommend using surf booties for this spot as it is quite dangerous to get in and out of the water and is not recommended to beginners. If you drive down the beach at low tide with a 4×4, be sure to watch the tides they can come up fast and you cannot get through the river section to get back to Santa Catalina. Waves helped push more than a few vehicles out of the river… don't get caught! Is a point break on the opposite side of the town of Santa Catalina, accessible by boat or by foot, about a 30 minute walk over the rock reef (bring shoes or booties!). It is a left point break surfed at low tide over a rock bottom ledge, with short rides, but big hollow tubes. It is known to break boards so be careful. Is a large island located directly to the left of Santa Catalina. You can get to the surf breaks by boat, about a 1 hour boat ride. There are 3 breaks on the island. One is a beach break with rights and lefts. The other is a right point over rock bottom. The other is a left point over rock bottom. Fluid offers kayak trips and excursions to this location as well.